April 16, 2010: Lonely Pluto floats in the darkness at the edge of our solar system. It's so far away even the Hubble Space Telescope has trouble making out the details. Nevertheless, Pluto is so interesting, even fuzzy images of the dwarf planet are compelling. The data reveal an icy molasses-colored world with a surprising amount of activity. Buie compared Hubble images taken in 1994 vs. 2003 and discovered that Pluto's northern hemisphere has brightened while the southern hemisphere has dimmed. Ground-based observations suggest that Pluto's atmosphere doubled in mass during approximately the same time period. And no one is certain what's causing the molasses-colored splotches on Pluto's surface. "It's baffling," says dwarf planet expert Mike Brown of Caltech. "For now, we can only guess. Although these images are the best we have to date, they just aren't clear enough to answer all the questions they raise." For instance, what's happening to Pluto's atmosphere? Pluto can get so cold, researchers believe, that its atmosphere can actually freeze and fall to the ground. If Earth's atmosphere did that, it would make a layer 30 feet thick, but Pluto has less to work with. When it’s on the ground, Pluto's entire blanket of air is no more than a frosty film of nitrogen and methane. "Until the mid-1980s, Pluto's northern hemisphere was tilted away from the sun for over 100 years, accumulating a substantial amount of frost," says Buie. "Now the northern hemisphere is coming into sunlight and appears, as shown in the Hubble images, to have been growing brighter." The atmosphere might also be changing in response to Pluto's highly eccentric orbit. During the late 1980s, Pluto approached as close to the sun as it ever gets (about 2 1/2 billion miles) and gradually started warming. Now the temperature on Pluto is up to a balmy -385 degrees Fahrenheit! Surface frosts exposed to such "warmth" may be subliming—that is, changing back into a gas. "Pluto, right now, has the best atmosphere it's had in our lifetime," says Brown. Researchers think these dark areas may be primordial organic matter. "We know there's methane on Pluto," says Brown. "Here's what we think happens: Sunlight hits the methane and breaks it apart into its chemical components -- hydrocarbons. Over millions of years this process makes a dark reddish-brown oil or tar like substance that sticks to the ground. These darker areas spread larger as they absorb more sunlight and cause additional frost to sublimate." 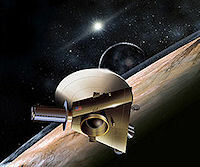 Right: An artist's concept of New Horizons at Pluto. "Now, Pluto is headed away from the sun again," says Brown. "It will gradually get colder and colder and its atmosphere will refreeze to its surface. In fact, that should have already started happening, but apparently it has not. It's a mystery." NASA's New Horizons probe is en route to investigate. The spacecraft left Earth in January 2006 and has been racing toward Pluto for an encounter in July 2015, hopefully before the atmosphere refreezes. "New Horizons will map the entire sunlit portion of Pluto," says Buie. "And as it swings closer, it will get very detailed images, maybe as good as 50-100 meter resolution." "This will allow us to explore some of the interesting areas we've pinpointed," he continues. "For example, the recent Hubble images reveal a very bright spot – brighter than anything else on Pluto – near the equator. And just to the left of that bright spot is some of the darkest terrain on Pluto's surface. We want to examine the area where these bright and dark areas are touching and figure out what's causing the differences. This is a good target because it includes every kind of terrain Pluto has to offer." "We know there are surprises waiting for us on Pluto," says Brown.